and learns a huge lesson. Love that M got to see and learn. 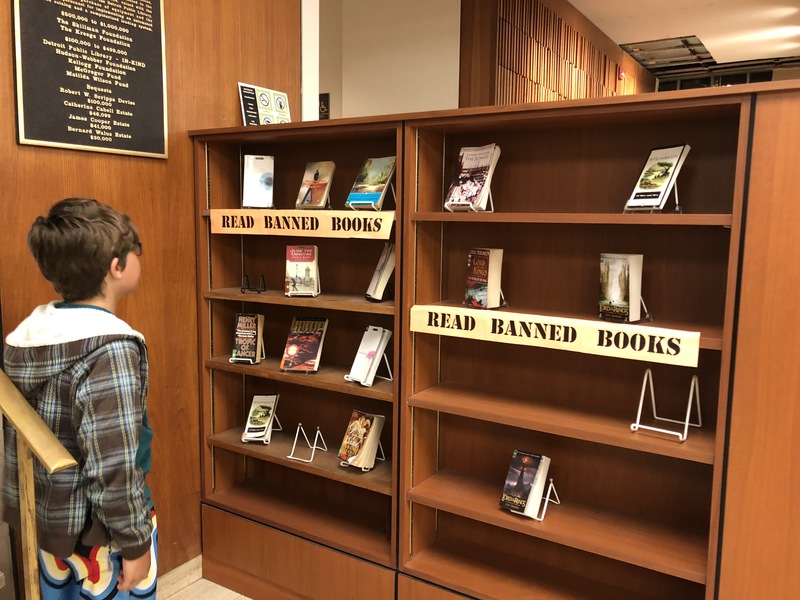 Our library always has a display during banned books week. Great lesson for us all to revisit. Let’s hope that that piece of history doesn’t repeat itself. Yes, Beth, people try to make our reading decisions for us. Awful! Libraries won’t stand for it. We are in a time when we must be wary of censorship of any kind, our books, our speech, and our free press. He must have been surprised to see Harry Potter on the shelf. Adults afraid of words. I don’t even know how to think about that. I’m with him. I don’t get it either. This is an excellent post from KSBeth about censorship! Thanks to her for the post and from the ULS, the Underground Library Society. A coffee house here in Chattanooga once had a gallery of photos of banned authors on display as you entered the shop. It was pretty cool. So true. A great lesson. I love the quote you included. I recently read two kids books, George, and go tell it on the mountain, that were banned! I couldn’t believe they were actually banned! It seemed ridiculous to me. it is amazing to think about, isn’t it?